Tai Chi Zero was something that I stumbled upon thanks to the Netflix recommendation systems a year or two ago, and I was immediately a fan of the Kung Fu Hustle-esque goofy nature mixed with some impressive martial arts. Hero is the sequel to Zero , and if you don't for whatever reason want to watch the first, but want to fill in some of the blanks the trailer for Hero should provide you with all the main details that you need to know. This is (in the entirety of the series) a story about how one of the most popular styles of Tai Chi came to exist, following one Yang Lu Chan (Yuan Xiaochao) from childhood on up (with a few little time skips). Hero picks up where it's predecessor left off, Chan having just successfully saved Chen village from an army of soldiers and steampunk creations (such as a giant armored tank-like thing ), as he gets married to Chen Yu Niang (Angelababy) - the daughter of the Chen-style master- so that he can be one with the family and learn Chen-style martial arts (which is forbidden to teach outsiders). Here in the plot, we discover the relationship between the two and watch it grow, as well as see many more interesting steampunk creations and meet other interesting characters. It's much like many Martial Arts films out of china that we've seen before, almost like a history lesson, but it differs in the fact that it does add elements of supernatural quality (mostly existent in the first flick, but still exist ant early into the second) over more than just jumping absurd heights, while also mixing in things that weren't so true to life such as the various steampunk elements. It helps to distinguish the movie from a crowd of similar flicks, as does the often comedic elements that invoke other sources (such as a "choose your fighter" game overlay at one point later in the film). It's a fresh spin, and thoroughly enjoyable. The cast does a wonderful job of acting, each making the characters feel a bit more alive than a typical martial arts flick (that can get some pretty stoic characters), probably in part to them all playing the quirks of their characters so well. On the English dubbing side, lines are delivered well enough that it's not a horrible experience, but there is always that slight disconnect with lining up a different language with the mouth movements of a native tongue, so keep that in mind (or watch it in Chinese with subtitles turned on for the authentic experience, just be warned that you may need to watch it multiple times to take in all the exquisite action and still know what they are talking about). Likewise, other audio aspects are quite well done, and the entire ordeal comes off rather high-polished in nature while still staying true to the mostly practical nature of the main body of martial arts movies. Speaking of martial arts, this does a great job at throwing in some different styles, with the overall Tai Chi looking incredibly fluid. Some fights appear brutal and power-driven (more so in the first title than this), whereas other fights (particularly the last of the movie) are so graceful that it feels more like you are watching some aged veterans performing an intricate dance as attacks and counters flow into one seamless stream. To add more to it than simply it being martial arts, the final fight also interposes cooking underneath the fighters, which really just drives home the fact that it's uses are near limitless and that it's less a way of beating someone up and more a way of life. It's an important aspect that is often forgotten by those who strive to pick it up, and the ying/yang nature of Tai Chi just points it out stylishly without being offensive about it. Of course, martial arts usually steals the show since that is what we are attracted to to watch this kind of film in the first place, but that's not the only thing that this movie brings to plate. We get to see the strains and developments of a father-son relationship amongst the Chen style grand master and his son (who cares less about martial arts and more about building things), as well as watch the relationship develop between Chan and his wife. All of this is given, as well as a continuing revenge plot from the "main villain" of the movie (who's original goal was simply to turn the town into a railroad). What this gives to us as viewers is inevitability on most fronts, and characters who feel a deal less one-dimensional to boot. Setting wise, things look mostly as you would expect from a movie that mostly takes place in the same village for most of its entirety. Things are predominantly period in-village and outside of it, with the turtle-like carcass of the steampunk creation destroyed in the first film being the only major indicator that this isn't exactly a normal place. This isn't to say things don't look well put together, it's just to say that variety is partially lackluster - a warehouse, a village, and the kitchen fight scene are pretty much the majority of scenery here and you see what you would expect in each (such as fields for the village, or empty dreary space in the warehouse). There is a nice addition at the very end, but it is just graced upon before the credits roll (although it did leave me hoping that they make a Ta Chi Three), that looks remarkably like some kind of steampunk Castle Greyskull. "Seriously, make a part three, I want to see more of steampunk Castle Greyskull." An enjoyable romp down various roads, it's both a serviceable Chinese historic martial arts film and a steampunk fantasy tale melded into one. Characters develop over time, and everything seems to have a reason and polish applied to it. 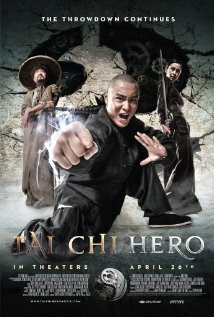 If you get the chance, I would highly recommend you to watch Tai Chi Zero first, as it gives you the story of Chan to get him to the point where this village and its Master take such an interest in him, but for the most part Hero is relatively self contained (outside of Chan's back story and the explicit reasoning the villain wants revenge against the village proper). I mean, the trailer really says it all.